Digital security cameras and systems are the most advanced and easiest CCTV camera type in the market right now. Unlike those old-fashioned analog CCTV surveillance cameras needing 2 cables to get power and data transmission, digital IP cameras only require 1 cable, or even 0 cable to function. So that’s the main reason why digital home security cameras are gradually dominating the security solutions. Here, you’ll get top 2 easiest digital surveillance cameras and systems (reviews & videos included). Plus, you can see the comparison details of digital and analog CCTV cameras (with stunning infographics). The below 2 digital IP CCTV cameras and systems got high praise from top-tier tech reviewers and customers. Big bonus — you’ll enjoy free shipping and 2-year product warranty here. 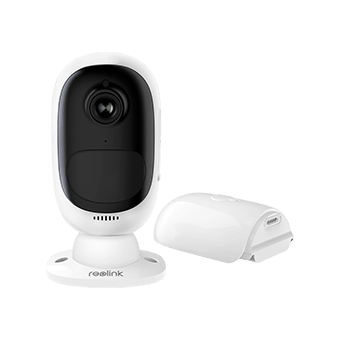 If you are looking for the best wireless digital home security camera, Reolink Argus® 2 is the one to consider. It’s not just wireless. “wire-free” should be the most accurate adjective to describe this cute and covert digital surveillance camera. You can view the below block to get more smart features of this digital video surveillance camera. A Reolink Argus® 2 big fan shared a video showing the impressive clarity of this digital wireless surveillance camera. This digital surveillance camera got featured in over 40 top-tier media, and has become one of the most popular smart home cameras among customers. You can check their feedbacks below. 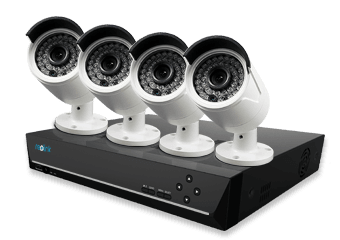 This system comes with 4 digital recording security cameras and 1 NVR for video storage. 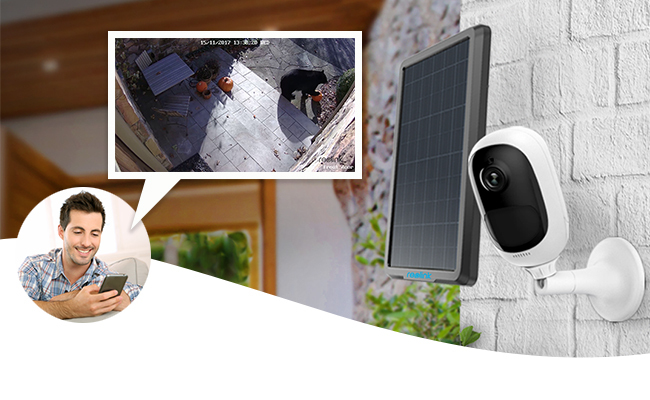 You can add another 4 Reolink digital IP camera types later, such as PTZ or bullet cameras. You can check more about digital CCTV camera system specifications and features below. A DIY lover shared a video showing how he arranged the connection and installation of this digital CCTV camera system. You can get some insights on digital CCTV camera wiring in this video. This system is one of the easiest and best digital IP surveillance camera systems, since you can just use Ethernet cables to get both power and data communication. The easy setup and perfect clarity of this digital CCTV security camera catch editor’s and customers’ attention. Check what they say about it. Good news is that you can buy the above digital CCTV camera and system in US, UK, Australia, Canada, Philippines, and other countries with free shipping. 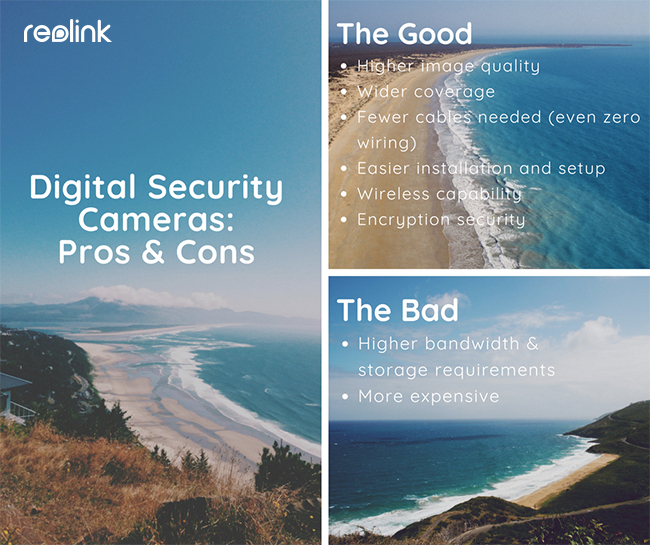 When choosing between analog and digital security cameras, you should check their differences, pros and cons respectively before your purchase. The main difference between digital and analog security cameras is the method by which video is recorded and transferred. Analog video security cameras record images and send the signal to the DVR (Digital Video Recorder) via the coaxial cable. The DVR converts the videos from analog to digital signals, compresses the file and saves the videos in a hard drive. Digital security cameras, on the other hand, rely on Ethernet cables or WiFi to transmit data directly to your smartphones, computers, etc. For more details about digital vs analog CCTV cameras, check their pros and cons first. You can also save and share this infographic below to spread the details of digital IP cameras. 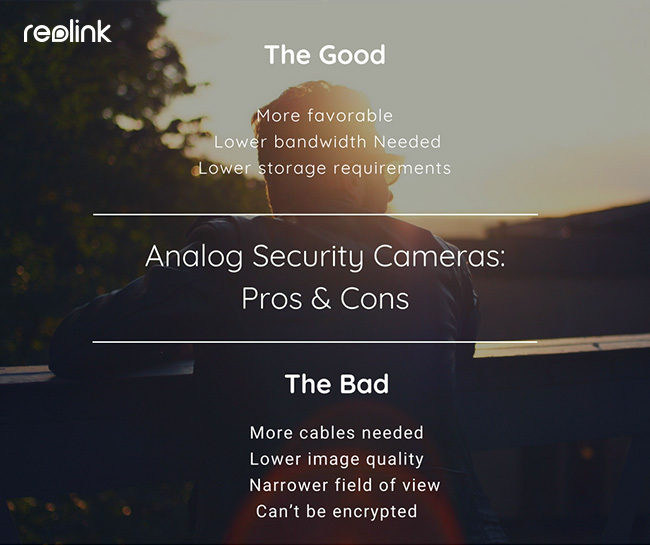 You can save this picture below to view the pros and cons of analogue security cameras. Weighing the price, the quality and the installation job needed of both CCTV surveillance camera types, digital IP security cameras would be the best option. And analog security cameras and other heavy big tank CCTV cameras will be knocked out of by easier digital security cameras. So keeping up with the easiest smart digital security cameras is undoubtedly the best way to go. If you have any ideas you wanna share with us, leave them in the comment below. This entry was posted in Buyer's Guide and tagged Digital Security Cameras.